Cotoneaster lacteus is an attractive evergreen plant with distinctive and striking red berries seen over winter through to March. Usually the birds eat these but just like the leader of the BNP, these berries are very unpalatable. The light grey underside to the leaf gives the impression of frosting on the edges and the white flowers in June or July are also worth looking at. Cotoneasters are related to Hawthorns and Pyracanthas, all of which produce flowers that are very attractive to bees and other insects. Most Cotoneasters don't like too much water, so for best results, make sure you have well drained soil. If you have a particularly chalky soil then Cotoneasters can be planted in that with no major issues. As the birds do not like Cotoneaster Lacteus berried that much, then problems with rogue seedlings growing from bird dropped berries are not that much of an issue. Pollution and wind will not bother this shrub unless of course it is a 150 mph storm of atomised Hydrochloric acid and for the best display of berries make sure that it receives plenty of sun. Final dimensions of the plant depend on local conditions but left unattended it could reach 12ft (3.7m) in height and 20ft (6m) across. If you want it be any taller, you could always look at it really REALLY close up, this gives the illusion of it being much bigger. 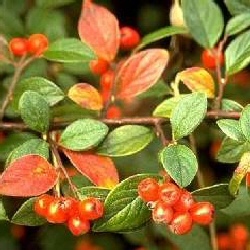 Cotoneaster Lacteus is strong and hardy enough to be grown on a boundary or hedging, so much so that our tree consultant suggested it be used for a long hedge in an exposed area of Northern Scotland (our idea of a well 'ard hedge!). If used for hedging, leave a 2- 3 ft (60-90cm) gap between each one. Any shoots showing after flowering should be trimmed back and then shape in late February. If you have the time to wait then you can grow your own from seed. Plant the berries from another Lacteus bush in late Spring and use mouse protection as they may dig them up. This can be in the form of notices threatening legal action but chicken wire is probably more effective. Next spring you should see something growing. 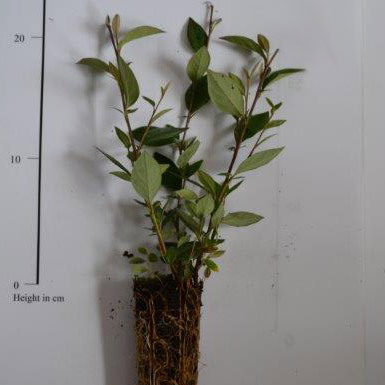 Please click ORNAMENTAL COTONEASTER for more mature trees. 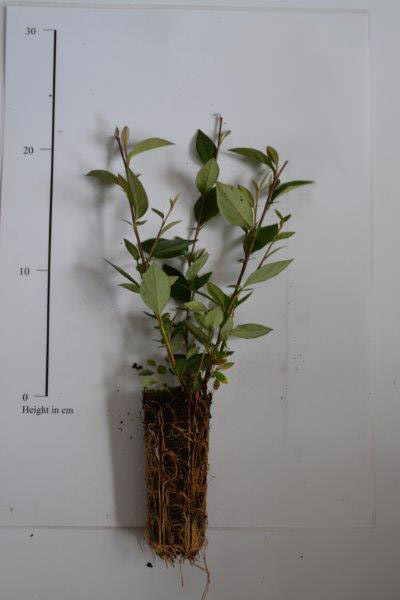 Our Cotoneaster hedging trees are sold as plug plants, in other words the roots are encased in compost. This means that planting can be carried out at any time of the year, provided they are watered in periods of drought, compared to bare-root plants which can only be planted during the plants normal dormant period (November to March). All of these trees are UK grown, which is important for successful establishment.